Spacious and private home close to beach with great views. A retired farmhouse renovated as a simple but comfortable dwelling overlooking Tryphena Harbour. Faces west, so gets the full setting sun. Surrounded by pasture and bush, totally private. Guided bush walk available and it’s close to the beach and shop. The beach also has a boat ramp and is safe and great for children. Like all Great Barrier residences, the house is totally off-grid - solar energy and bottled gas for cooking and hot water. Two wood burners for winter warmth and comfort. Wi-fi and television (Netflix and Freeview). Lots of living spaces, 3 bedrooms, each with a queen bed. Extra sofa-bed and single mattresses if required for additional guests. Feel free to discuss additional guests or bed arrangements with owner Unlimited creek water and extensive parking if you have a boat. This property consists of spectacular bush that is protected by a QE2 covenant. A comprehensive predator-control programme is underway to encourage the native bird life. A guided bush walk can be made available upon request. My parents and two other couples stayed at this property for two nights. They loved the house itself, the scenic vista, the bush walks nearby and the proximity to the Mulberry store. They felt like staying longer. The beds and linen provided were clean and comfortable. The information provided was helpful. Derek couldn't be there but his neighbor popped in a couple of times and was extremely helpful with information and booking a restaurant for dinner. I found Derek very responsive and easy to communicate with when making arrangements. The house was great, Derek was a super helpful host and is close by. He gave us loads of good advice of places to visit on the island. The house is large with loads of lawn space. We were a group of five and weren’t crowded. We took our car over on the ferry which made getting around really easy. Would highly recommend staying here to anyone!! This home was everything we could have asked for! We were 3 couples and each had our own room with comfy beds. There were 2 bathrooms, 2 sun rooms (one with an awesome view of the water) and a nice balcony. The kitchen had all you needed to cook and we enjoyed the fireplaces in the dinning & family room at night. Derek was an amazing host in answering questions before hand and giving advice on things to do on the island. Wifi worked well, plenty of parking and even a short walk away from a general store, cafe, bar/restaurant on the water. 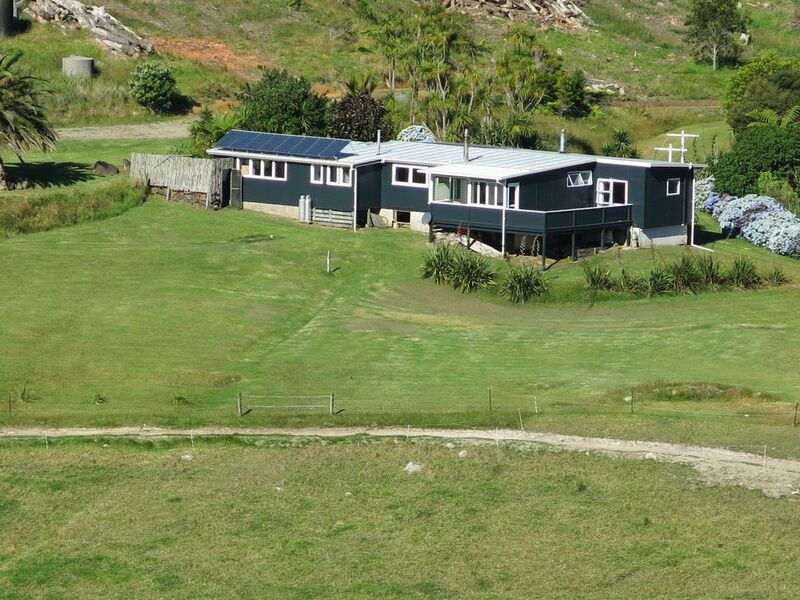 Do note the house, and the whole island, is off grid. This means rain or creek water to drink and no hair dryers as the house's power is from solar panels. Even with this, as it is part of the charm, all 6 of us enjoyed our stay and would come back! P.S. Sunset was amazing from the balcony! Thanks for all those positive comments and it’s great that you had such a good time. And yes - being off-grid has its small challenges like no hairdryers! You would be welcome back anytime! Perfect home for our family holiday! We stayed at this property for 3 nights and absolutely loved every minute of it. Being a large family group (9 adults and 2 children), we often struggle to find a place that's available to accommodate all of us and that doesn't feel too small. This property was perfect and so spacious too. It allowed us to be together without feeling like we were in each others space at every moment! Derek, the owner went out of his way to make sure we were comfortable for the duration of the stay, even providing extra towels and linen for the sofa bed and extra mattress that we required. Communication with Derek was great from the time we booked to the last day of our stay, which meant we knew exactly what to expect. And this beautiful, spacious property with magical views far exceeded our expectations. We were so grateful to have had the opportunity to stay at this wonderful property and create some unforgettable memories! We couldn't have asked for a better home for our family holiday and hope to come back to enjoy this property some day. We have already highly recommended it to extended family and friends! Thanks Rochelle. It was a pleasure having such a lovely family staying in the house and enjoying it so much. Hope to see you back here one day!